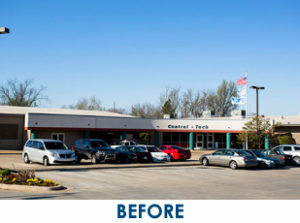 Central Tech Board of Education members voted unanimously Tuesday, March 10, 2015, to approve a major exterior renovation for the main building on the Sapulpa campus. The building became home to Central Tech in 1978, when the school opened the Sapulpa campus by purchasing and renovating an old Gibson’s Discount Store. The new look will correspond with the campus’ industrial and safety building, which opened last year and houses a Heating, Ventilation, and Air Conditioning (HVAC) class as well as Business and Industry Training. The exterior restoration will greatly enhance the image of the Sapulpa campus while reflecting the style of the Drumright campus. Central Tech has allocated resources from the school’s building fund for the past few years in preparation for the renovation. This allows the technology center to make the necessary improvements without requesting a bond issue. Building plans and specifications will be advertised for bid with plans for the construction to begin in June. The project may include parking lot improvements for the main entrance. Central Tech anticipates the construction to take several months to complete and be ready to tour by the annual open house held in February. For more information call 918.224.9300. 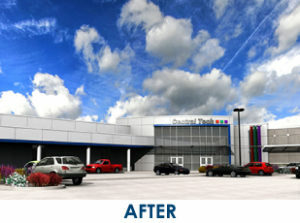 Central Tech Board of Education members voted unanimously Tuesday, March 10, 2015, to approve major exterior renovation for the main building on the Sapulpa campus. The new look will correspond with the campus’ industrial and safety building, which opened last year.